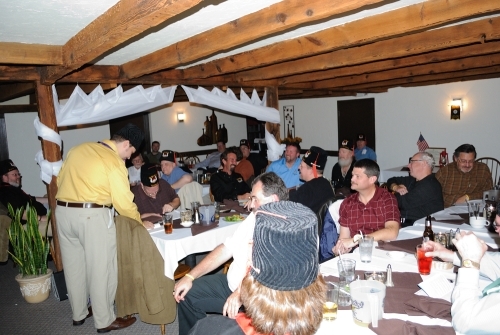 Ubar Grotto recently held its November meeting at the Lucky Ducks Bar and Grille, located in Elizabethtown, PA. Unlike most fraternal bodies, members of Ubar Grotto look forward to our monthly meetings, as the reservation list will attest. Of the 40 members of Ubar Grotto, only 7 were not present for the November meeting! Add on to that number a couple of guests and it was a packed house! On the morning of the meeting Pro. Seth Anthony, Monarch, received a phone call from Pro. David Chambers, 1st Vice President of the Ohio Grotto Association and Past Monarch of Achbar Grotto in Columbus, Ohio. Pro. Chambers decided to make a last minute visit to the land of Ubar and was inbound for the meeting that night! This kind of visit is what makes Grotto really special. Pro. Chambers drove over 6 hours to visit us that night and from his account, it was a great time. The evening started with a fabulous meal catered by the Lucky Ducks Bar and Grille. The staff always does a great job and provides top notch service and meals. Ubar is especially appreciative of their willingness to work with the Grotto as it grows. Following the meal, the lads were treated with a presentation by Lilli Vanilli, Sponsorship Coordinator, and Lizzy Stardust, Secretary to the Board, both of Harrisburg Area Roller Derby. The gals discussed the resurgence of this sport in the Central PA area and graciously answered the members questions (including a description of every injury they’ve sustained while participating in the sport!) At the conclusion of their presentation, the Monarch presented the ladies with a sizeable check to make Ubar Grotto an official sponsor of the team. For the next year, attendees at HARD Bouts will see an Ubar Banner at the rink, Ubar advertisements in the program guides, and of course a horde of fez wearing fans cheering the girls on! With all the excitement of HARD finished, the members tiled the room and started the meeting. The usual humor was injected by the members and Secretary, with barely a minute going by without raucous laughter coming from the crowd. The annual elections were held, with all of the elected officers remaining in place for the coming year. Pro. Ted Sizemore was elected to a three year term as trustee. The Monarch also announced one change in the appointed officer line up, installing Pro. Rev. Dr. Christopher Rodkey as Chaplain. Heck, with that many titles ahead of your name, how can you not make that guy an officer! The real business being completed, the group was turned over to the Vizier who led the induction of 5 new Prophets into the realm – Mark Mattern, Greg Schaeffer, Chris Fry, Harry Smith, and Scott Smeltzer. The new members were quite impressed with the ritual of the Order and all expressed the sentiment that it was unlike any Masonic experience they have ever had. This puts Ubar Grotto at exactly 40 members, having taken in a total of 12 since the Constitution ceremony in July of 2011! After the induction, the meeting was closed in peace, with members retiring to the deck for a meeting of the Pipes and Papers Unit. 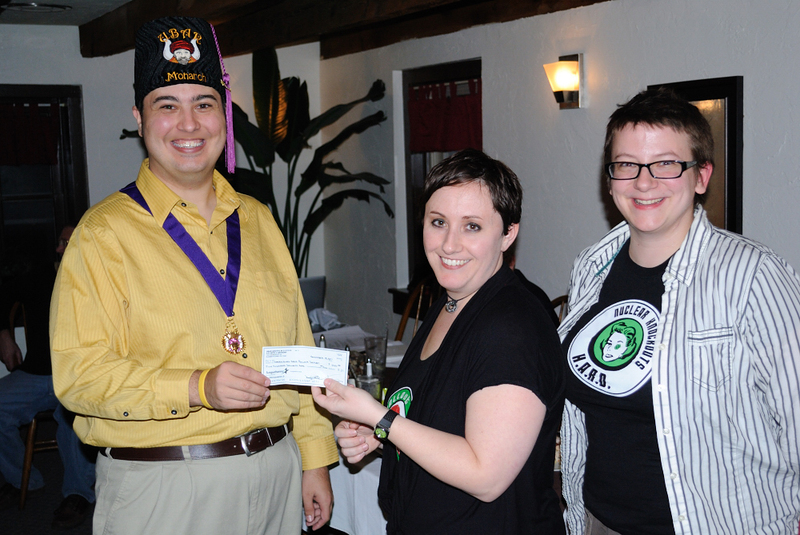 Ubar Grotto’s next meeting will be on January 8, 2012, so mark your calendar and plan to join us!